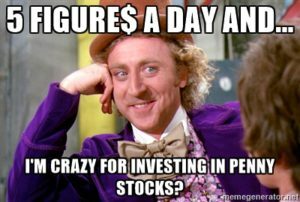 Gene Wilder, ‘Willy Wonka’ the OTC Markets most used meme, dies. Actor and writer Gene Wilder, who brought his signature manic energy to films such as The Producers, Blazing Saddles, Young Frankensteinand the role that forever ensconced him in the collective memory of a generation of children, Willy Wonka & the Chocolate Factory, has died, Wilder’s nephew said. He was 83. Wilder died today at his home in Stamford, Conn., of complications from Alzheimer’s disease, according to a statement from his nephew Jordan Walker-Pearlman. A classically trained actor and student of Lee Strasberg’s famed Actors Studio, Wilder started out playing dramatic roles on the stage in off-Broadway productions of Roots and One Flew Over the Cuckoo’s Nest. In 1967, Wilder landed his first big-screen role in Arthur Penn’s classic Bonnie and Clyde. 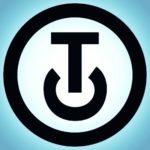 Wilders’ images have been known to be shown all around social media since its invention to bring attention to certain companies or, conversely to break up the monotony day trading sometimes brings. 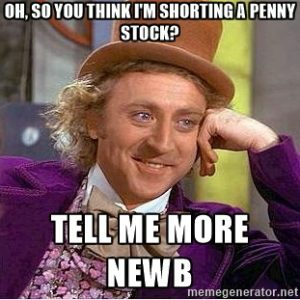 Leave your favorite ‘Willy Wonka’ penny stock meme’s in the comments! In his first leading role as nebbishy accountant Leo Bloom alongside Zero Mostel’s blustery theater impresario Max Bialystock, Wilder was nominated for an Academy Award for Best Supporting Actor. The Producers would later land on American Film Institute’s list of the 100 greatest comedies ever and spawn both a remake and a hit Broadway production. Wilder’s collaboration with Brooks would result in a pair of beloved 1974 comedies: The Western parody Blazing Saddles and the monster movie sendup Young Frankenstein. In the former, a box office smash and Number Six on AFI’s best comedies list, Wilder portrayed the “Waco Kid” alongside a cast that included Cleavon Little, Slim Pickens and Mel Brooks. Rain Pryor, the daughter of Wilder’s frequent collaborator Richard Pryor, who passed away in 2005 at the age of 65, took to Facebook to share her grief. In the late 1950s, he got his start after being accepted into the Actors Studio. At that time, he felt that “Jerry Silberman in Macbeth” didn’t have a great ring to it, and he chose his stage name Gene Wilder. Gene Wilder first became a household name after landing one of his first film roles. The Producers became a cult classic, and Gene’s role of Leo Bloom is unparalleled. Many have taken on Bloom’s shoes since Gene, but no one has come close to this comedic genius. In 1971, Gene auditioned for the role that he will forever be known for, Willy Wonka. At the time, he thought he hadn’t landed the role. Director Mel Stuart, who was a Wilder fan, ran after Gene and offered him the role on the spot. Gene’s continued success led him to work with many great talents, but three actors stand out after his days as Willy Wonka. 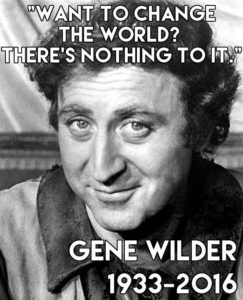 Gene worked with Richard Pryor, Sidney Poitier, and Gilda Radner during the last decade of his most active period of acting. He was briefly married to Gilda Radner, until her untimely passing from ovarian cancer. Since 1991, he had been married to actress Karen Webb. 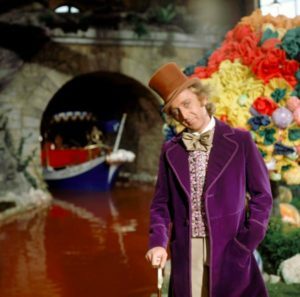 In the last decade, Gene hasn’t been active at all in acting on-screen, but a talent and “Pure Imagination” like his will last for many decades to come. Hats off to you Mr. Wilder. From your friends at OTC Newswire.